Congratulations to "Mary P." and "Joyce M.", the winners in Susanne's giveaway. Thank you to all who participated! Hello. I want to thank Maureen for the opportunity to blog with you again. Comment for your chance to win one of two electronic copies of The WhiteCarnation, the first book in the Harvester series. To put everything in perspective, it’s important for you to understand that I’m a pantser, an author who writes without an outline. My novels are character driven and evolve as the characters do. When I began writing The White Carnation, I didn’t expect it to grow, change, and become the story it did, but once I realized how it was changing, I knew this wasn’t a book that could be finished in three hundred pages. To do the story justice, it would need to be expanded as there were other love stories to be told as the characters moved closer and closer to identifying the Harvester and the evil at work behind him. Writing a series of books where the characters continue to search for answers, while the main characters change and new characters are introduced isn’t a task to be undertaken lightly. My respect and admiration go out to J.K. Rowling who managed to do this so well in her Harry Potter series, not once but eight times as there is a new book available now, one that’s been turned into a stage play and debuts in London this spring. In each of the Harvester series books, there is a romance that begins in the story and is resolved within the book. In The White Carnation and The White Iris, books one and three, I chose to work with second chance at love stories, both of which revolve around the issue of trust in a relationship. I’ve seen many marriages and relationships destroyed by a lack of trust or an abuse of that trust, and since I’ve been married 44 years, I know just how important trust is. In The White Lily, book two, I chose to write about two broken souls who’ve suffered abuse at the hands of others and yet aren’t destroyed by it, but rise above their circumstances and find love and comfort together. What does continue from book one to book three is the search for the serial killer known as the Harvester/Prophet, who himself undergoes a metamorphosis as the books progress. Like many megalomaniacs, the Prophet doesn’t act alone, but manages to find people he can shape and change to his way of thinking. It’s always been that way and sadly, nothing going on in today’s society shows that will change anytime soon. The biggest challenge I faced in writing this series was ensuring that each book was as good as its predecessor. 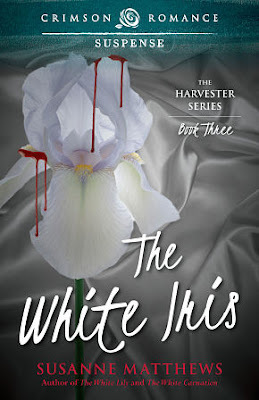 As all authors know, readers expect to be entertained when they read, and my job was to see to it there were as many shivers in The White Iris as there had been in The White Carnation and The White Lily. I introduced the concept of the Great Burning briefly in The White Carnation, expanded on it in The White Lily, but it’s not until The White Iris that the absolute horror of the plan is revealed. As I researched and learned more about the various aspects of weapons of mass destruction, the more I leaned toward biological warfare, but keeping it honest, possible and plausible was a must. I had to balance the technical aspects of the situation in such a way that the reader understood the dangers, but I couldn’t get so complicated that only a doctor would understand. There were also a number of loose ends that had to be resolved and clues planted in previous books that needed to be pulled together in the last one. To be honest, the research for this book taught me many things and I consider that a real bonus. Because each book can be read as a stand-alone novel, I also had to make sure, the reader of book three had enough information not to find the book frustrating, but not so much information as to bore the reader who’d read the previous novels. This isn’t always an easy task, and there’s a danger of making something an info dump, an unforgivable sin as far as my editor was concerned. Giving too much information is a crime on equal par with not giving enough. Finally, as I got to the end of The White Iris, I realized I wasn’t ready to say goodbye to Rob, Tom, Trevor, Jacob, Faye, Lilith, and Julie. I’d created a strong well-balanced crime solving team, and while the Harvester/Prophet case was resolved, there’s an opportunity to come back and use the team to solve other vicious crimes in the future. While I wrapped up everything up with a bow, the book is open to another “white flower” book if I want to write one. As they say in the theatrical business, always leave them wanting more. Time's running out for Special Agent Trevor Clark and his FBI task force. They're no closer to uncovering the identity of the Prophet, a dangerous serial killer who has been murdering new mothers and vanishing with their infants. If Trevor can't unlock the clues, the killer's threats to unleash what the FBI suspects is biological warfare could mean death for all of them. His only recourse is to swallow his pride and reach out to his former fiancée, the CDC's renowned virologist, Dr. Julie Swift. Two years ago, Julie ended their engagement after Trevor abandoned her when she needed him most. Now, faced with the possibility of the greatest epidemic since the Spanish flu, she has to put her faith and her safety, as well as that of countless others, into the hands of a man she doesn't trust. Can they set aside their differences to stop the Prophet, and in doing so, will they find the love they lost? From the streets of Boston to the wilds of Alaska, this thrilling conclusion to the Harvester Series takes several turns you won't see coming! Not content with one subgenre, Susanne writes romance that ranges from contemporary to sci-fi and everything in between. She is a PAN member of the Romance Writers of America as well as a member of the Trans Canada Romance Writers Group. When she isn’t writing, she’s reading, or traveling to interesting places she can use as settings in her future books. In summer, she enjoys camping with her grandchildren and attending various outdoor concerts and fairs. In winter, she likes to cuddle by the fire and watch television. 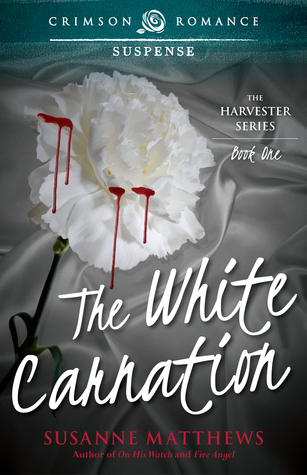 Comment for your chance to win one of two electronic copies of The White Carnation, the first book in the Harvester series. Giveaway ends 11:59pm EST March 15th. Please supply your email in the post. You may use spaces or full text for security. (ex. jsmith at gmail dot com) If you do not wish to supply your email, or have trouble posting, please email maureen@justromanticsuspense.com with a subject title of JRS GIVEAWAY to be entered in the current giveaway. I need to know more about the Harvester. This series intrigues. Thank you for having me this morning. It's always a pleasure to blog here. My favorite genre is romantic suspense and if there's a detective in it the book is a must read for me. It sounds like The White Carnation is a must read. I can't wait to get it! Your covers are eye catching & beautiful, Susanne. Thanks to all who commented. I appreciate what you have to say.